Men’s tennis entered 2018 with expectations that haven’t been around the Bass Rudd Tennis Center since 2015. Louisville returned all key players and are no longer inexperienced. Six games into the season, the Cardinals were 3-3. The losses were against likely NCAA tournament teams, yet Louisville didn’t shy away. Since clocking in at .500, Louisville has won 11 of their last 12 matches. The biggest victory came at home when Louisville routed the two-time defending champions Virginia 6-1. The winning streak hasn’t come from just one area of play. Louisville entered the season knowing their depth sets them apart. They returned all six courts, adding standout junior college transfer Federico Gomez. Add that to the group along with the development of Santiago Salazar, Clement Filho and Fredrik Moe and it’s easy to see why Louisville is a dangerous team. While having depth is great, a team needs stars to win matches — and Louisville has just that in Gomez, Chris Morin-Kougoucheff and Parker Wynn. Owning the first three courts this season, the trio is 37-7 in singles matches. Morin-Kougoucheff (10-2) hasn’t lost a singles match since Jan. 27. Ecarma called Gomez the team’s enforcer prior to the season and he is 13-4 this spring. No. 98 Wynn (14-1) is Louisville’s highest ranking singles player. Wynn is just a sophomore, but he is on track to put up program-record numbers. He currently has a 75-16 record in singles matches. “Parker is a game-day guy. When the lights are on and they turn on the scoreboard, you don’t ever have to worry about Parker,” Ecarma said. The top three courts are obviously a strength for the Cardinals, but Louisville is one of the few teams in the country that essentially starts each match 1-0. U of L hasn’t dropped a doubles point since Feb. 4. Their 12-match winning streak might be a program record according to Ecarma. Their doubles lineup, lead by the team of No. 14 Morin-Kougoucheff/Wynn (14-3), is one of the most feared in the nation. 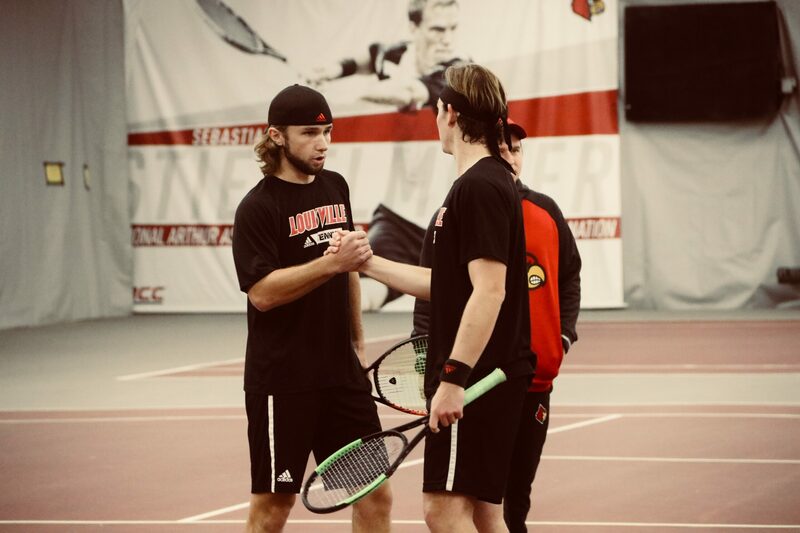 Three stud singles players and a dominating doubles lineup gives Louisville an edge every time they step on the court. “We know what we got. We have a chance against anyone when you have three guys who aren’t afraid of anyone,” Ecarma said. The Cardinals have controlled teams during their winning streak. All but two matches have come in convincing fashion, amassing a combined score of 64-13 in their last 12 matches. With the team on a hot streak, one wouldn’t think Louisville needs any advantages — but some things just happen. Recently, Louisville discovered a scouting report left by an opposing team. Naturally, Ecarma’s staff is using it to their benefit. As the regular season cools down, the Cardinals are perched high in the ACC — currently third. Louisville’s goal is to host an NCAA tournament match. To achieve that, the Cardinals must be one of the top 16 seasons in the country. Ecarma says No. 38 Louisville has that opportunity as they play three top 10 teams soon. “If we could finish off really strong, upset some of these teams … if you can go 5-0, 4-1, you’re definitely a host. If you win two or three, you’re close,” Ecarma said. Ecarma said his team is mature enough to understand hosting is their goal. The Cardinals have hosted twice in the previous 12 years, once in 2006 and again in 2010. Ecarma compared 2018’s team to 2006 and said this year’s team is a superstar away from being close to 2010. Louisville has seven matches remaining and five are against the top 30. In position to finish the season on a high note, the Cardinals must come prepared.